With this product you can accumulate up to 451 Glitter Points. Leaves skin firmer and refines texture. 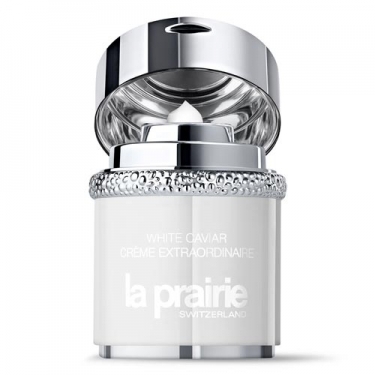 DESCRIPTION: White Caviar Crème Extraordinaire from La Prairie is a sumptuous cream infused with Lumidose, an extraordinary molecule of light. Helps the skin to achieve new levels of luminosity and uniformity. Helps regain lightness of younger and healthier skin. It contributes to a significant reduction in the visibility and intensity of age spots, diminishing their appearance. It improves the appearance of lackluster skin with changes of tone, visibly combating the imperfections to obtain a luminous complexion. Leaves skin firmer and refines texture. The skin becomes smoother, improving its elasticity and hydration. Apply morning and / or evening after cleansing and toning the skin and apply the serum; Release the perfect dose by operating the airless dispenser; With the tips of the fingers, spread gently across the face, avoiding the area of the eye contour; Allow to absorb completely.